Like an old Brunswick mahogany bar or the Schlitz globes adorning the former tied houses dotting Milwaukee and Southport Aves, traces of Chicago’s history resonate in its architecture. Fittingly, there are a bunch of places where you can eat and drink with figurative -- and in one case, literal -- city ghosts. 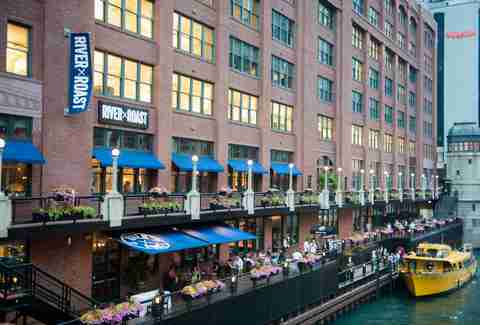 From speakeasies to old banks, a mobster social club, a haunted performance hall, a bathhouse, an ice skater warming house, and one house built in 48 hours, here are the strange histories of 10 Chicago restaurant and bar locations. 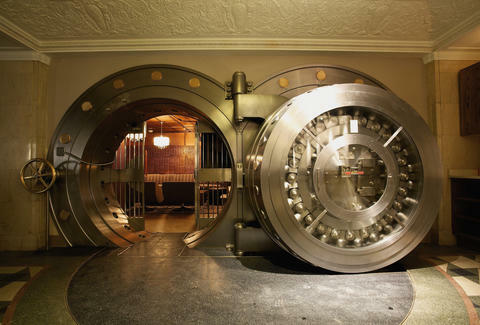 Literally anchoring this sprawling lower-level restaurant and bar is the clearest indicator of its origins: a massive bank vault where drinkers can sip cocktails amid the walls lined with lockboxes. Built in the 1920s, this historic landmark designed by Karl M. Vitzthum originally housed the Home Bank & Trust. The name is inspired by the exterior, built from limestone mined in Bedford, Indiana. You can also find original aspects of the building’s design in a few other unexpected places, such as wooden safe-deposit box viewing rooms in the restrooms and teller windows used as accent lights in the ceiling of the private dining room. The house started operating as a public house sometime before 1919, but went completely off the map at the start of Prohibition. A year after alcohol was legalized in 1933, it was licensed as the Hideout Inn and has been operating continuously ever since. Now a low-key neighborhood haunt known for live music, dance parties, Oscar Wilde readings, and offbeat historical reenactments. In 1994, when Mitch and Cliff Einhorn signed the lease for what would become stalwart biker bar the Twisted Spoke, they learned that the owner of the worn-out building with Flintstones-esque stone façade was retired, reputed midlevel mob enforcer Frank Covello. Built most likely as a garage in the early 1900s, the building was a gas station and market before becoming a near West Side social club. 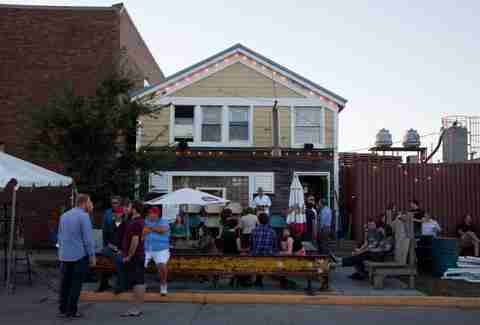 “It was a place where city workers could go for a beer while they were allegedly still clocked in,” says Mitch. The Einhorn’s suspicions about the building’s gangster past only grew when they began demolition. Opened in the 1920s as the Luxor Russian Baths, 2039 W North Ave was a respite for hard-working immigrants to come for a steam, a nip of vodka and a bowl of borscht after a long workday (since the old transit station -- now the Bloomingdale Trail -- was just a few blocks away). 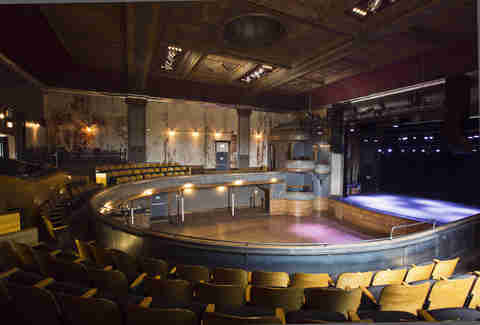 The building remained a bathhouse until the 1960s when the neighborhood fell on hard times and it ambled from transient hotel to brothel. 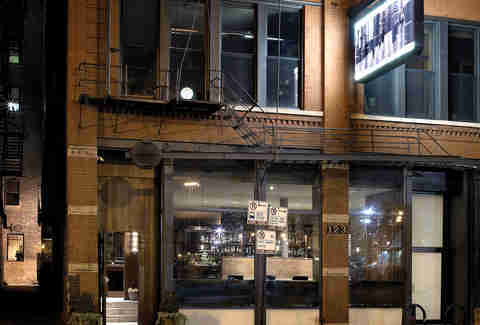 By the ‘90s the city of Chicago pushed in the courts to demolish the then-boarded-up building, but it was purchased and converted into apartments on the upper floors and Shawn McClain’s lauded Spring restaurant downstairs. Trenchermen opened in 2012, maintaining the original white tile and other pieces of the building's past within the space. Though the baths have long stopped running, the drinks still flow like... borscht. This riverfront temple to all things roasted sits inside the historic, sprawling Reid Murdoch Building. Commissioned by George Simmons, it was built in 1914 for Reid Murdoch & Co., one of the country’s largest wholesale grocers. It housed corporate offices and warehouse space, with several floors dedicated to manufacturing and processing cheeses, coffee, ketchup, sugar, fish, bread, and pickles, plus a humidor where tobacco was rolled for cigars. The riverfront location enabled shipping through a supply chain that connected steamers on the south side to railroad spurs on the north side. Beneath LaSalle St, the building’s shipping platform was used to load trucks that delivered to merchants all over the city. It also connected with the city’s Downtown freight tunnel system. The City acquired the building in the 1950s, where it housed the traffic court, the State's Attorney’s office and other municipal offices until Friedman Properties bought it in 1998. The year after the Great Chicago Fire of 1871, James McCole built this two-story balloon-frame wooden structure with a detached cottage in back just before the city passed a fire code ordinance prohibiting construction of wooden commercial buildings in the Central Business District. It began as a grocery store with the rear cottage acting as living quarters. Vito Giacomo opened a restaurant on the first floor in 1921 (and many of the original fixtures are still intact). Over the years, the restaurant was sold and ultimately renamed the Green Door Tavern in a nod to its past: a restaurant with a green door during Prohibition let patrons know there was a speakeasy inside. Built in 1912, the little structure perched at the edge of North Pond in Lincoln Park initially served as a warming house for ice skaters. Over the years, it spent time as a storage shed, a homeless shelter, a natural foods store, and a hot dog stand before neglect took over to the point where a tree actually took root through the boiler, sometime in the ‘90s. 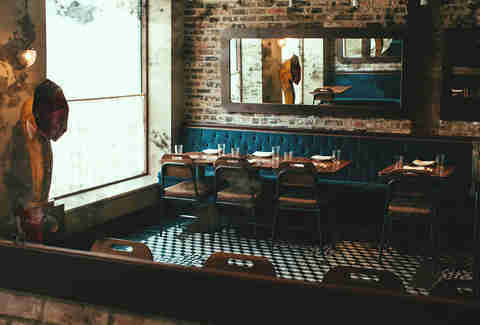 Architect Nancy Warren convinced restaurateur Richard Mott to negotiate with the Chicago Park District for a long-term lease to justify the investment required to renovate the building, which began when he took ownership of the derelict space in 1998. 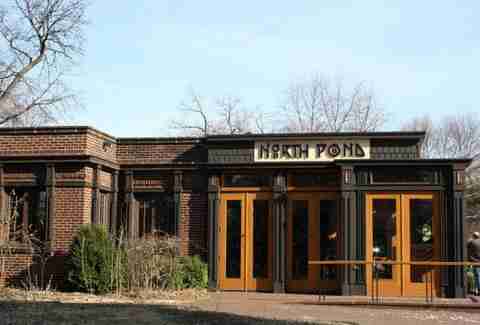 The refurbished design that now houses the Michelin-starred restaurant and its James Beard award-winning chef was modeled after prairie-influenced arts and crafts. 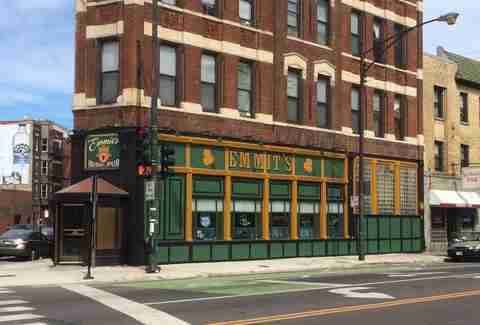 Though Emmit’s opened in 1996, the building at Grand, Milwaukee, and Halsted has officially housed a tavern since 1934, the year after Prohibition ended. Built during the 1890s, the site formerly housed a savings and trust catering to Chicago’s mafia, during which time tunnels were purportedly dug from the building to other buildings in the neighborhood to serve as hideaways or escape routes. Following Prohibition, a series of unsuccessful taverns opened at the site as the once-thriving neighborhood declined. In 1981, three partners bought the building and opened O’Sullivan’s Public House, which became a popular hangout for cops. Two would-be robbers were shot to death in the bar in 1985, not knowing they were up against Chicago’s (off-duty) finest. 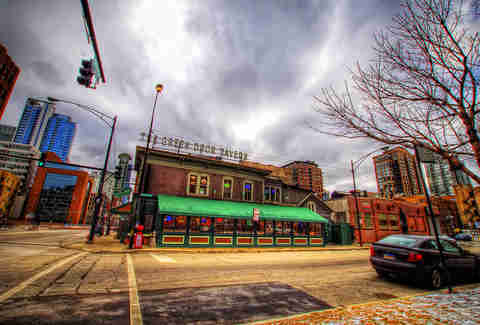 The bar was also reportedly known for dwarf tossing, though Mayor Harold Washington purportedly shut that down. The colorful O’Sullivan’s closed 1989 and remained vacant till 1993 when current owners (and firemen) Kevin Doherty and Ron Halvorsen bought and rehabbed the bar. 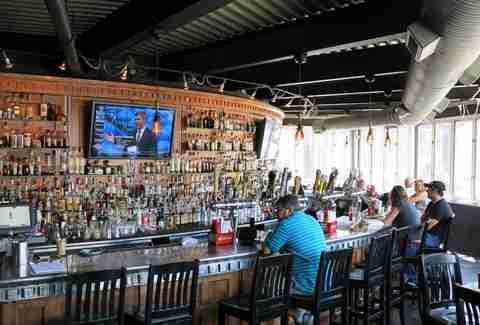 Emmit’s has appeared in such films as Ocean’s Eleven, Backdraft, and Uncle Buck. Maggie Hennessy is a freelance food + drink writer and chef who loves nothing more than a great food story (except maybe eating). Follow her latest meals and musings on Twitter, Instagram and at maggiehennessy.com.